The plumbing trade uses a lot of unique terms, words and phases that may sound like gibberish to anyone not employed as a plumber. Below are some common plumbing terms and definitions, many of which have pictures and links to more detailed articles on the subject. Air admittance valve - Also known as a cheater vent; is a device that allows air to enter the drainage system, but stops sewer gasses from leaving. Although these are acceptable in some circumstances; such as an island vent, they are frowned upon, hence the name cheater vent. Air gap - Means the vertical distance between the water supply outlet and the flood level rim of the fixture it discharges into. Example: distance between the faucet and the top of the sink. Auxiliary water supply– A water supply that is in addition to the primary supply. Example: your home is connected to municipal water supply and you also have well water available. Backflow - System water is going in the opposite direction from normal flow. Backflow preventer - A device or other means, installed in the piping system to prevent backflow. Examples: check valve, double check valve, reduced pressure principle backflow preventer, air gap. Back-siphonage - negative pressure in the piping system which results in backflow. Commonly prevented with a vacuum breaker or air gap. Backwater valve - Used in drainage systems to prevent backflow. Bathroom group - Term to describe the common bathroom. One toilet, one sink, one bathtub/shower. Building drain - The lowest drain pipe in your system also known as the Main drain. Building trap - A trap installed in the building drain to prevent air from circulating between the public sewer and private sewer. Check valve - A device that allow flow in only one direction. Cleanout - A fitting installed in the drainage pipe to allow cleaning and inspection. Dead end - a pipe that is capped off. Drainage system - All of the pipes, fittings and fixtures that waste water drains into. Dry fit - Coupling pipes together without any glue or solder to ensure a proper fit. Emergency floor drain - A floor drain that is not expected to be regularly used. Fixture - Anything that discharges sewage or clear water waste. Example: Sink, water closet, bath tub, floor drain or washing machine. Fixture drain - The section of pipe between the trap serving a fixture and another part of the drainage system. 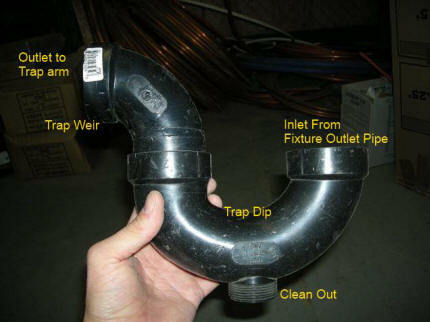 Fixture outlet pipe - The pipe that connects the fixture to the trap. Fixture unit - A theoretical measurement of the amount water a fixture will need supplied and is likely to discharge to the drainage system. Flood level rim - The level of a fixture where water will begin to overflow. Indirect service water heater - A water heater that is heated with steam, hot water, or warm air from another source. Example: a coil from a hot water boiler heats the water. Indirectly connected - Has a physical separation. Example: a boiler drain which terminates above a floor drain. Individual vent - A vent pipe that vents only one fixture. Offset - The term used to describe a pipe that connects two parallel pipes. Some offsets in a drainage system may require an offset relief vent. Potable - Means water that is safe to drink. Relief vent - An additional vent to increase air flow in a branch or stack. Riser - A water supply pipe that goes through at least 1 story. Sanitary building drain - A building drain that carries sewage from the upper most water closet(toilet). Service water heater - A water heater that heats the water independently of other heat sources. Example: electric water heater. Sewage - Waste water that is not clear water or storm water. Water discharged from a kitchen sink is considered sewage. Soil-or-waste pipe - A pipe that carries sewage in the sanitary drainage system. Soil-or-waste stack - A soil-or-waste pipe that goes through one or more stories. Stack vent - A vent pipe that extends from the top of a soil-or-waste stack and connects to vent header or terminates outside. Story - The vertical distance between two floors. Subsoil drainage pipe - An under ground pipe designed to convey ground water away from a structure. Also known as weeping tile. Trap - A fitting or piping arrangement designed to prevent gasses from entering the home; by keeping a section of the pipe filled with liquid. Trap arm - The section of pipe between the vent and the trap weir. Trap dip - The top of the bottom part of the trap...See picture above. Trap seal depth - The vertical distance between the trap dip and the trap weir. Trap weir - The point on a trap where water will begin to flow down the trap arm. Vent header - A vent that connects stack vents and vent stacks to outside air. Vent stack - A vent pipe that is connected to a soil-or-waste stack below the lowest soil-or-waste pipe connection and terminates outside or connects to a vent header. Venting system - The pipes and fitting that provide air circulation for the drainage system. Water distribution system - All of the pipes and devices that provide water to the fixtures. Water service pipe - The water supply pipe to a building.